Leaders are communicators. When a leader has a cleverly crafted message that is hard to understand it is like looking at the car in this image. The car looks cool. You are just not sure what the builder intended. In this post I share four questions that will bring more clarity to your message. Clarifying your message is hard work. History helps us to see the payoff. Turning the pages of history we discover that great leaders were also communicators. Let's consider two leaders, the Scottish reformer John Knox and our 32nd President, Franklin Delano Roosevelt. It is easy to bring more clarity to your message. Just ask these four questions. Question 1: Have I asked God for his help? Moses was looking for any excuse to get out of the Exodus assignment. Stuttering and stammering, Moses complained to God, “O Lord, I have never been eloquent, neither in the past nor since you have spoken to your servant. I am slow of speech and tongue." God responded with five words that every communicator must memorize: "Who gave man his mouth?" If you want more clarity, start by asking for help from the One who made your mouth. Question 2: Have I identified my subject? "If you aim at nothing you'll hit it every time." This applies to communication too. What are you trying to communicate? Specifically, what is your subject? If you are talking about bicycles then say it: "My subject is bicycles." Now, stick with bicycles. Don't talk about bikes and trikes. Next, once you've found your subject, narrow it. When it comes to bicycles, you can talk about the joy of riding them, how to fix them, why bicycles are better than tricycles, bicycles built for two, classic bicycles, racing bicycles ... you get the point. If you want more clarity, identify your subject and then narrow it. Question 3: Have I written my "ugly sentence"? Everyone can get clearer communication by answering four questions. Make sure your ugly sentence has a key word. Mine is "questions." Your key word is your anchor that is going to keep your talk from drifting. When it comes to your key word, Davis says you've got to know it, memorize it, and think about it as you speak or write. For example, if your subject is bicycles and you are aiming at convincing people to start riding their bikes again, your key word might be "benefits." "Today I am going to share with you four benefits of riding a bicycle. Here's the first benefit .... "
If you want more clarity, write your ugly sentence. Make sure it has a key word. Then use it! Question 4: Have I asked someone to evaluate in advance? Who evaluates your communication? People who submit to the pain of evaluation are people who will communicate more clearly. The good news is that you don't have to wait until after you have communicated your message to get feedback. Give your draft to two trusted (and honest) friends. Ask them for candid feedback. Specifically, you want to know what works, what does not work, and why. If you want more clarity, ask someone to evaluate your presentation in advance. Sometimes, as in the picture below, we can be both clear and clever. 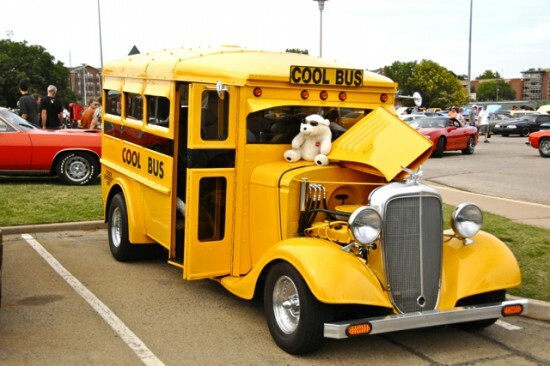 The school bus is definitely a cool bus. It feels good when clear and clever walk hand in hand. But make clarity your goal, otherwise your talk will end up like the funky car at the top of this post. You don't want people walking away after your talk saying, "Now what did he say?" Clear trumps clever. May God make you clear. Douglas Bond quotes Percy on page 67 in The Mighty Weakness of John Knox. Orlando, FL: Reformation Trust Publishers. 2011. Jonathan Alter, The Defining Moment: FDR’s Hundred Days And The Triumph Of Hope. Page 269. Alter, The Defining Moment. Page 306. Ken Davis, "Key Word: Choose it and Use it!" www.dynamiccommunicators.com. Accessed August 29, 2012.